These skills tend to come into play at different times in the buying cycle, as shown on the left side of Figure 16-1. 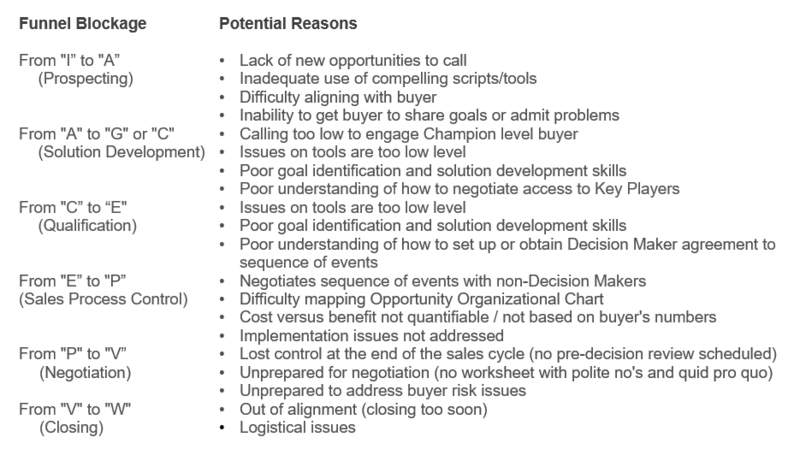 On the right side are the deliverables that a sales manager can monitor to assess the skills of each salesperson. A discussion of proof management and monitoring success metrics is beyond the scope of this resource. The shapes of funnels vary greatly by salesperson. The funnel of someone exhibiting high activity but low skill mastery in the area of business development could look like a martini glass, with many conversations (As) needed to generate Gs. As opportunities enter and progress through a salesperson's funnel over the space of a few months, if there are blockages where deals tend to stall, this points to a probable skill deficiency. We'd like to show how to assess funnel data so that skills can be assessed and—wherever necessary—the sales manager can come up with specific plans containing activities needed to shore up weaknesses. Let's now assume that over a period of 2 or 3 months, there are blockages in a salesperson's funnel—which, again, point to likely skill deficiencies. Look at Figure 16-2. Ask to see the letters, faxes, and emails that the salesperson is using to generate interest. It could be they are not worded properly, or are geared toward the wrong vertical industry or title. The manager could help write the documents and design a more effective strategy. Ask the seller to spend some time with a peer who has realized great success in business development. It may be appropriate for the person who is struggling to listen to one of his or her peers making calls, or following up on leads, to see that person's approach. The sales manager could role-play being a buyer taking a prospecting call from the seller. Review the menu of goals for each Key Player that the seller is using. Help the seller generate and use the Success Stories that take a buyer from a latent need to sharing a goal. Role-play with the seller to walk him or her through approaches to getting goals shared or problems admitted. If opportunities stall at G status, there are two areas that are likely to need addressing. The first is that the seller lacks the ability to take a buyer from goal to vision, meaning he or she is either not using the correct Solution Formulator (SF), or is having difficulty executing it. Again, the manager could review the material being used and could role-play with the seller. The manager could also make joint calls with the seller and demonstrate how to use the SF. Another reason for stalling at G status can be that the seller has difficulty getting prospects to agree to Champion them and get them to the Key Players who need to be accessed. This difficulty can occur because the buyer's vision is not compelling (letters should be edited), there is not sufficient value in the mind of the buyer, or the seller is not able to defend or explain the need to meet with the Key Players requested. In such cases, the suggested approach would be to make joint calls—either face to face or via conference call. It is also possible that potential Champions are being offered proof without the seller's using a quid pro quo approach to getting access. If most of his or her Champions are at relatively low levels, there may be difficulty relating to more senior executives. This skill can be developed via role-playing and making those executive calls jointly. The seller may be having difficulty in gaining consensus and negotiating a Sequence of Events with the buying committee. The manager should have the seller take him or her to visit accounts where all Key Players have been met, but where no Sequence of Events has yet been finalized. The seller may be attempting to qualify people at relatively low levels within organizations as Champions. 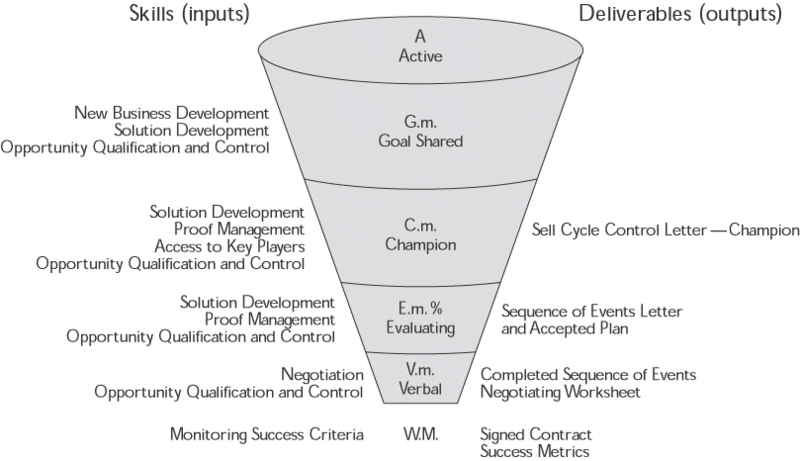 As stated earlier, a salesperson's quality of life will be better if he or she can get decision maker level Champions. In such cases, access to Key Players is most often volunteered, rather than the salesperson's having to ask or negotiate for it. Once an opportunity reaches E status, the seller and manager should have at least a 50 percent chance of having the sell cycle result in an order. In our opinion, the single most important variable in determining win rates is which seller initiated the opportunity (again, caused someone who wasn't looking to change, to look). Having an agreed-on plan in place affords the manager visibility into whether or not the opportunity is moving forward. By evaluating the status at each checkpoint, managers take some ownership of and responsibility for determining that the transaction is winnable. As soon as it appears that things are not proceeding as planned, the manager and seller should strategize as to how to get things back on track. And as always, in some instances, it will be necessary to withdraw. This should (will have to?) be the manager's call.